They thought the danger was over. They thought the alien had been destroyed. A government experiment gone horribly wrong; a shapshifting predator unleashed; a government team dispatched to stop her at all costs. But Sil survived, somehow - she's out there - free to breed more of her kind. And free to kill. 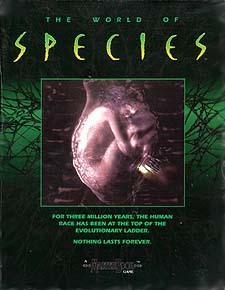 The World of Species lets you be the hunter or the hunted - special government agents mutated by alien DNA to challenge the paranormal and the deadly, or alien progeny unleashed on an unsuspecting world. Included are details on character creation, the mysterious Agency, the aliens themselves, equipment, character templates, and "Blood and Desire," a World of Species mini-adventure.